In the hospitality world, we run a business where profits are measured in nickels and dimes not hundred dollar bills. Every drop of Liquor, Wine and Beer is fundamentally important to your bottom line. Spillage, Shrinkage, and Employee theft results in millions of dollars in losses to restaurants and bars every year. Consider this: 6 extra drops of spirits in a beverage is equivalent to 1/8 of an ounce. If the bartender in your bar free-pours 100oz of spirits per day, but each time pours 1/8 oz too much...The loss to your bar after one year is $22 885.50 Can you afford not to train your bartenders to pour accurately? Inventory control systems can cost tens of thousands of dollars, and your bartenders will find a way around them. Ball bearing pour spouts, and pouring into a jigger or shot glass are accurate less than 80% of the time. Proper on site bartender training in free-pour technique safeguards your profit margin, and bridges the gap between the bar staff and the management/ownership, so your team can tell from across the room who’s over pouring or under pouring... No scales, no measuring tapes, no scanning, no nonsense. The Good News: You don’t have to purchase costly inventory control systems, software, scales, or specialized pour spouts that clog up. BartenderOne Restaurant and Bar Services will identify areas where your bar is bleeding money, suggest simple, time tested solutions that will give you a return on your training investment in weeks... Not months or years. BartenderOne is 100% accountable. If you dont profit, you dont pay. From the location of your glassware, back bar set up, to the way your refrigerator doors open, to the amount of ice in your glass, there are many factors that affect the efficiency and profitability of your bar. Consider This: The average bartender (the one currently behind your bar) makes approximatly 2.3 drinks per minute (138 drinks per hour) during busy times. If your average drink costs $5, the bartender will generate $690 in sales per hour. One 3 hour speed training session will increase your bartenders’ ability to produce quality beverages during busy times by 27% or an additional 37 drinks per hour ($185 per hour) Over the course of a year ($185/hr x 5 hour shift x 4 shifts x 50 weeks = $185,000 in incremental sales per bartender! Increase Productivity : Decrease Controllable Costs = Higher Net Profit. Consider This: The culinary association of America has identified the hand crafted “Culinary Cocktail” as the #1 emerging trend this year. 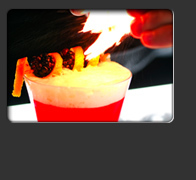 Your bar staff need to be able to create cocktails based on your guests unique tastes and preferences. From simple hand crafted cocktails with a twist, to advanced techniques like Molecular Mixology, on site bartender training will keep you ahead of the curve and is the best way to differentiate yourself from your competition, ensuring that your guests come back for more and bring their friends. Consider This: Every bar serves a rum and coke, not every bar serves it with style. 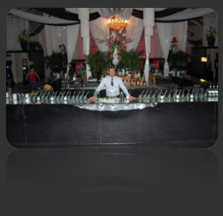 One of the simplest ways to differentiate yourself is by providing a little bit of showmanship behind the bar. Your bartenders will learn 15 jaw dropping, eye popping, zero risk skills that will engage your guests in conversation and keep them coming back for more. These techniques do not take up any extra time, in fact, many of the techniques will speed up service at your bar!